BACKGROUND: Online social networks may be a promising modality to deliver lifestyle interventions by reducing cost and burden. Although online social networks have been integrated as one component of multimodality lifestyle interventions, no randomized trials to date have compared a lifestyle intervention delivered entirely via online social network with a traditional clinic-delivered intervention. 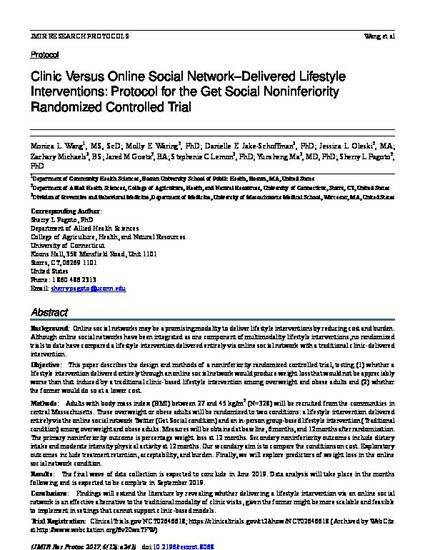 OBJECTIVE: This paper describes the design and methods of a noninferiority randomized controlled trial, testing (1) whether a lifestyle intervention delivered entirely through an online social network would produce weight loss that would not be appreciably worse than that induced by a traditional clinic-based lifestyle intervention among overweight and obese adults and (2) whether the former would do so at a lower cost. METHODS: Adults with body mass index (BMI) between 27 and 45 kg/m(2) (N=328) will be recruited from the communities in central Massachusetts. These overweight or obese adults will be randomized to two conditions: a lifestyle intervention delivered entirely via the online social network Twitter (Get Social condition) and an in-person group-based lifestyle intervention (Traditional condition) among overweight and obese adults. Measures will be obtained at baseline, 6 months, and 12 months after randomization. The primary noninferiority outcome is percentage weight loss at 12 months. Secondary noninferiority outcomes include dietary intake and moderate intensity physical activity at 12 months. Our secondary aim is to compare the conditions on cost. Exploratory outcomes include treatment retention, acceptability, and burden. Finally, we will explore predictors of weight loss in the online social network condition. RESULTS: The final wave of data collection is expected to conclude in June 2019. Data analysis will take place in the months following and is expected to be complete in September 2019. CONCLUSIONS: Findings will extend the literature by revealing whether delivering a lifestyle intervention via an online social network is an effective alternative to the traditional modality of clinic visits, given the former might be more scalable and feasible to implement in settings that cannot support clinic-based models. TRIAL REGISTRATION: ClinicalTrials.gov NCT02646618; https://clinicaltrials.gov/ct2/show/NCT02646618.